What better time to master the basic skills of knitting than when there are so many wonderful patterns available, including those in Woman’s Weekly, of course! Our workshop is perfect for you if you’ve always wanted to knit and never got round to it, or started but gave up and want to have another go. It’s also ideal for the novice knitter who wants to improve their technique. Following the great success of the workshops at our Woman’s Weekly Live! shows, we’re delighted to give you the chance to learn with our expert technical team. Tina Egleton is our Technical Knitting Editor. She loves knitting and designing patterns for us. Tina began her working career in the design department for Emu Wools before working in magazines and has since worked for knitting designer Debbie Bliss and on numerous knitting books before joining Woman’s Weekly. She’ll be there, along with Marva Brown, our Technical Knitting Assistant, who has many years of experience in knitting, and Freddie Patmore, our Knitting Assistant and the newest member of the knitting team. 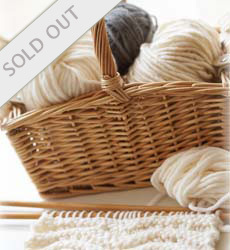 She previously worked as design consultant and workshop tutor for Rowan Yarns. Susan Horan is the other member of the WW team. A former knitting editor, she’s contributed to lots of knitting and crochet books and has helped check and designed patterns for Woman’s Weekly for some years. 11.45am Knitting in stripes and colour blocks, how to join in a new colour. How to increase and decrease. With basic making-up skills. Please note: makes may differ from images shown. Woman’s Weekly has the right to change the itinerary of the day. Tickets cost £59 per person, and will be made available on 5 February 2014. Tickets will be allocated on a first-come, first-served basis. Please keep your booking confirmation as this is your ticket for the event. The day will start at 10am with tea and coffee and finishes at 4.30pm. Tea, coffee and water will be provided. Please note that tickets to this event are non-refundable, unless it is cancelled or postponed. A guest list policy will be in operation at the event. Shortly after purchasing tickets, you will receive an e-mail confirmation: this is your ticket to the event, so please retain it for future reference.